Complete separation of components, four high powerTriode , two-way stereo, each power up to 100W. 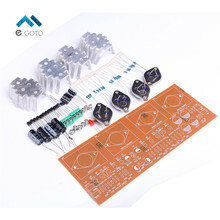 This amplifier by typical OCL circuit, it has the advantages of high stability, wide frequency response range, fidelity and good, in the high fidelity aloud equipment often use this circuit. The OCL stereo amplifiers for the vast number of electronic assembly enthusiasts and audio enthusiasts.